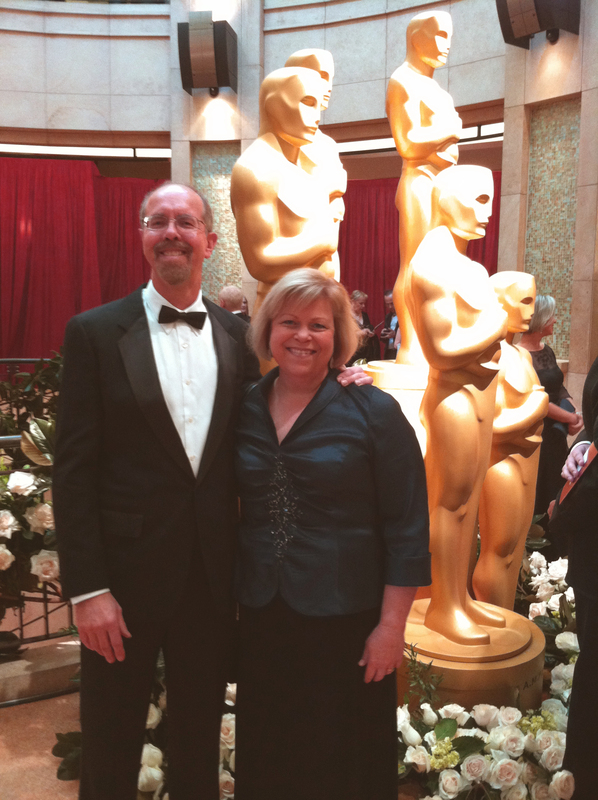 frans and his lovely wife, jennifer, went to the oscar show on sunday. very exciting! i watched the show on tv from my cozy spot on the couch. so many colorful outfits and tuxedos everywhere! 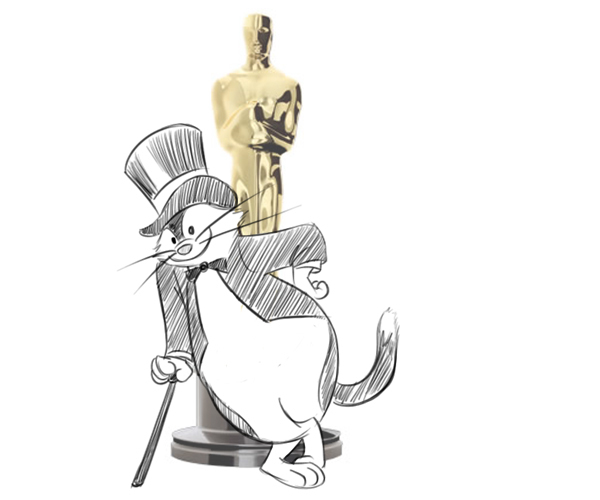 but that’s nothing special to me- i wear my tuxedo every day, even when i go to sleep! 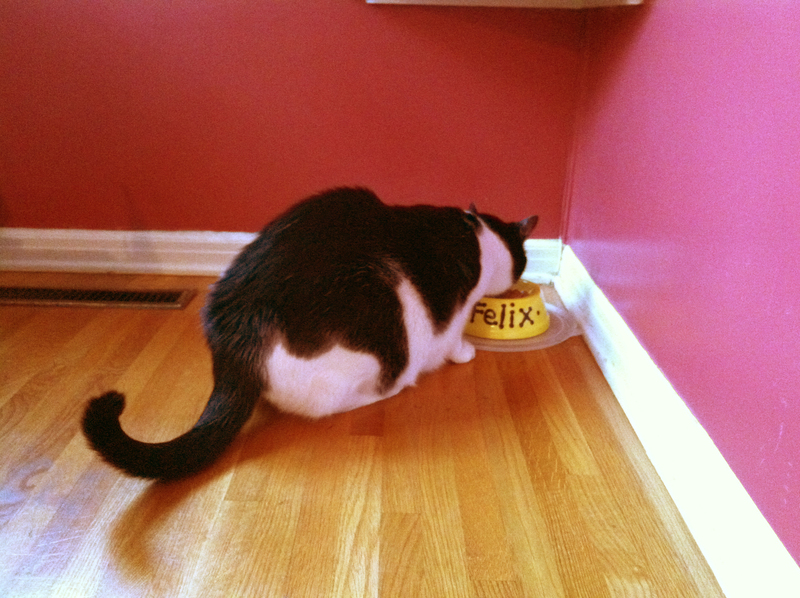 tuxedo cats are a special brand- we’re classy with highbrow tastes. especially in food! take for example my oscar night dinner- i had a wolfgang puck special of sweet crab-stuffed spanish peppers appetizer and a main course of shrimp okra tomato gumbo and nutty gorgonzola apple rings for dessert! yay! 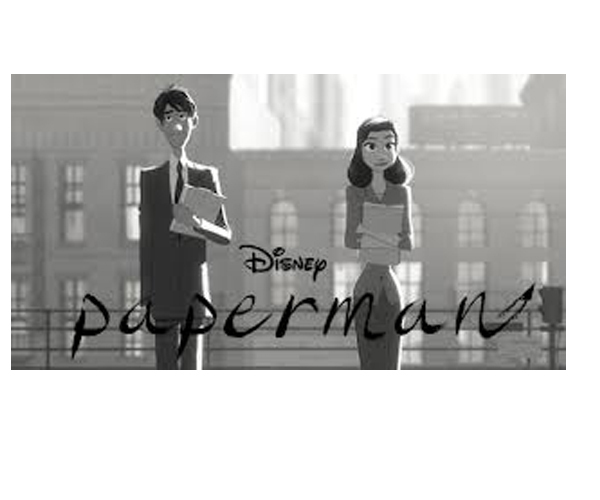 “paperman” won the academy award for the best animated short film! congratulations for all that worked on it! let the celebrations begin! i’m ready for some yummy finger, er, paw food! bring on the shrimp cocktails and smoked salmon and cucumber canapes and curry cheese spread and spicy chicken wings and artichoke on rye toasties! i’m getting animated again! i’m just jumping up and down and running all around. well, actually, i’m just lounging on my comfy pillow, but frans is working on a book-trailer for my upcoming book, and i do a lot of running around there. i can’t say too much yet, but here’s a hint, it deals with christmas time. i get to do all sorts of fun things in the house. the new book will be in stores in september. i love christmas time. i can already taste the yummy turkey and ham and stuffing and cherry pie with ice cream and chocolate sauce. i wish christmas was already here! 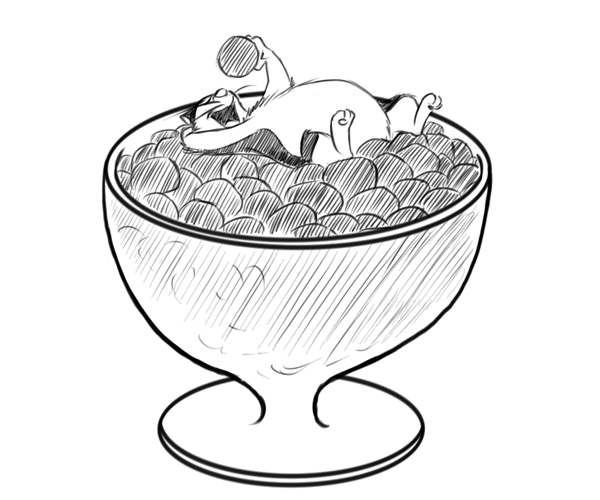 i think of life as a big bowl of chocolate. sometimes i like to ruminate on my life, pondering what it all means. i think about walking through the backyard and looking at the flowers, or climbing up the stairs and visiting the bedrooms, or lounging on the couch or stretching out in the laundry basket on the clean clothes. but i do my best thinking when i’m eating. especially snacks, and absolutely sweet snacks. the sweeter the better. and that made me come to a deep understanding of life, and that is that the sweeter the food i eat, the sweeter life is. all that thinking makes me tired, so i’m going to stop thinking for a while and take a long catnap. and i’ll think about life some more tomorrow. i would love to go frolicking in the woods with a toy pop gun, running around making lots of noise. 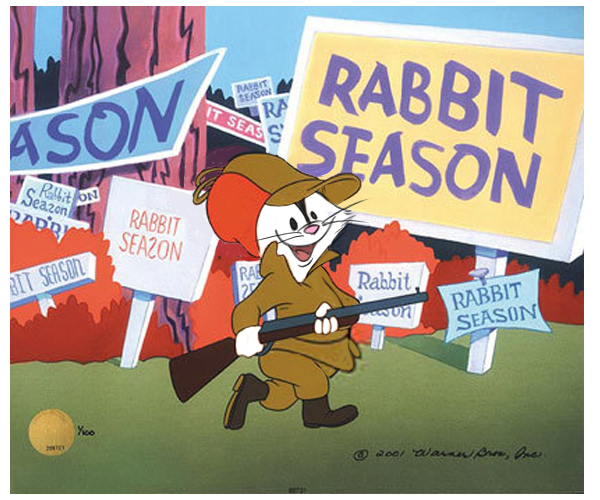 just like in the cartoons where the clever rabbit outsmarts the hunter, i would sneak up on a squirrel or a duck and wake them up with a loud pop! then they would jump and stretch their bodies and bulge their eyes. what fun it must be being a cartoon character. you can do whatever you want- you could slam into a tree and bounce right up again or make your head double in size, or your arms can pop off your body and pop right back on again. and you could eat all the time without ever getting full! 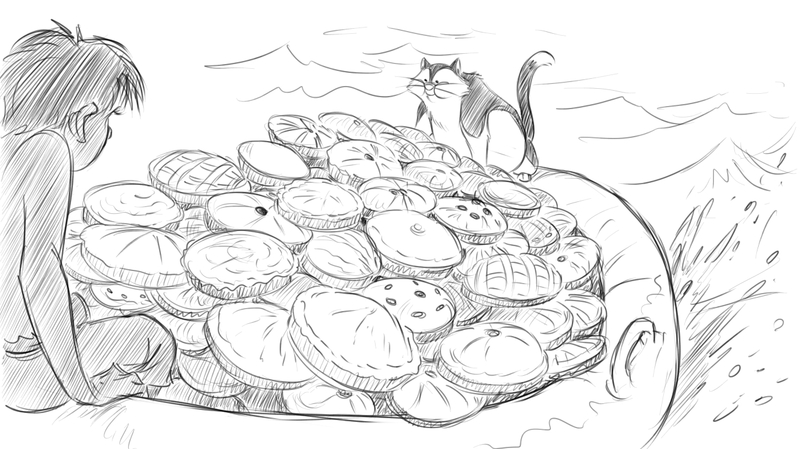 the touching story of a boy and a cat alone on a boat in an ocean of uncertainty- facing danger from the water’s depths, they feed their souls on the meaning of life and their bellies on apple crumble, blueberry, caramel pecan, chocolate peanut butter, key lime, rhubarb and maple walnut pumpkin pies. my family was watching a movie on tv about some poor kids in an orphanage who had to line up every night for dinner and hold their little bowls out so an awful man dumped the most disgusting slop from a big ugly pot into their bowls. and they didn’t get dessert either! that would be my worst nightmare! no more yummy fried chicken or chili dogs with relish or mashed potatoes and fish sticks or tuna melts with swiss cheese and loads of ketchup… it’s enough to make a grown cat cry! i’m getting depressed just thinking about it, so i’ll think about dinner tonight instead. grilled marinated swordfish with tar tar sauce and garlic and olive oil and lemon for garnish. i’m feeling better already! yes! my absolutely favorite thing in the whole world-eating! 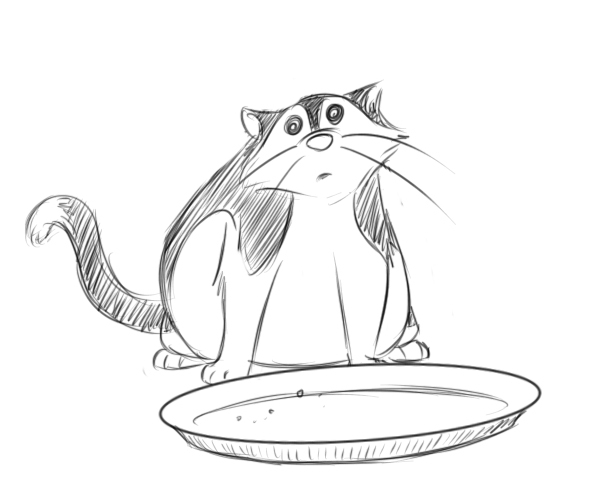 this kitty is having a very small meal- it must be just an in between meals snack, like smoked sardines or shrimp and avocado or salty potato chips with spicy salsa. that would keep me going until dinner time. and then it’s the real deal- rosemary and garlic leg of lamb with minced garlic cloves and diced onions and maybe a baked potato on the side with some butter and bacon bits and sour cream. that will tide me over till breakfast! i would make a great gourmet chef, creating yummy pastries and cupcakes and carrot cakes and cream puffs and chocolate cranberry fudge cakes and double-chocolate puddings and all sorts of things to tickle my tummy. problem is, i would never be able to finish my masterpieces because i would eat them before i was even done. 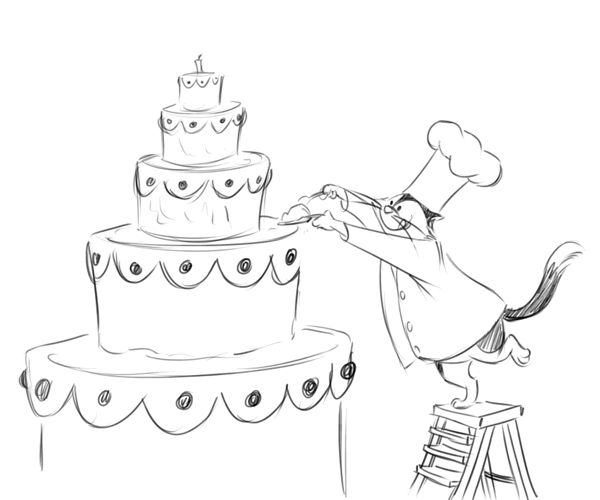 i don’t know how those chefs make all those yummy things without eating any of it! they must be very frustrated people. 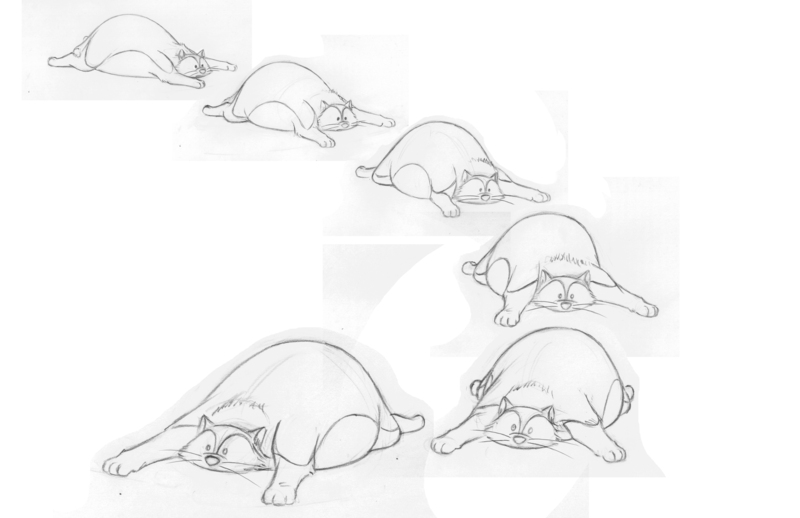 maybe i’m better off just being a fat kitty.